A dry January. Saving money. Being sensible… SNORE. Lots of people are keen to give up alcohol in January, and as long as I have a suitable replacement, I can maaaybe get on board with the idea. How about swapping evening drinks for ice cream? Seems sensible to me…for now. 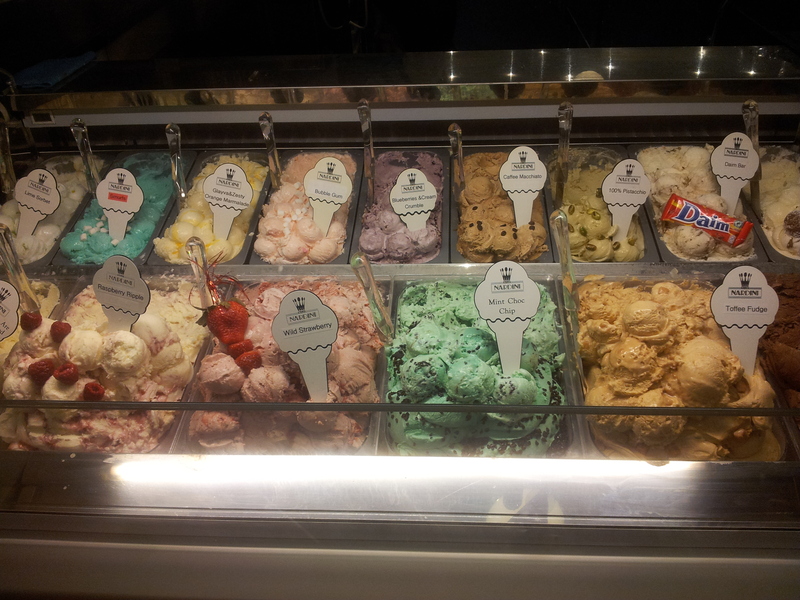 Nardini’s in Bruntsfield, Edinburgh, is the perfect place to do this. Open until late, the old school ice cream parlour has over 20 different sundaes to choose from, hot and cold, so it definitely gets my January blues vote. The cake department isn’t bad either; bakewell tarts, chocolate brownies, and apple slices are also on the menu alongside teas coffees and hot chocolates. We chose to sit in to enjoy our non alcoholic, ice cream treat, but if you are taking away, the colours and flavours of ice cream are mesmerising. I’ve no idea what “smurf” (top left, second from end) tastes like, but I’ll definitely being going back to find out. At the moment I can only vouch for the classic banana split (which I didn’t actually split with anyone, despite it being enormous :s). What’s in it? Double vanilla ice cream, belgium chocolate ice cream, hot chocolate fudge sauce and a banana. Simple, but effective! The ice cream was so creamy and flavoursome it made me wish I’d been more adventurous with my choice, the hot fudge sauce was plentiful (underneath the ice cream) and the presentation was both classic and fun. I should mention I’m a stickler for cocktail umbrellas and the like. We weren’t the only ones with the idea to head to Nardini’s. The cafe was full of other Edinburgh dwellers deciding which flavours to try, sharing their sundaes and having a PG rated night out! 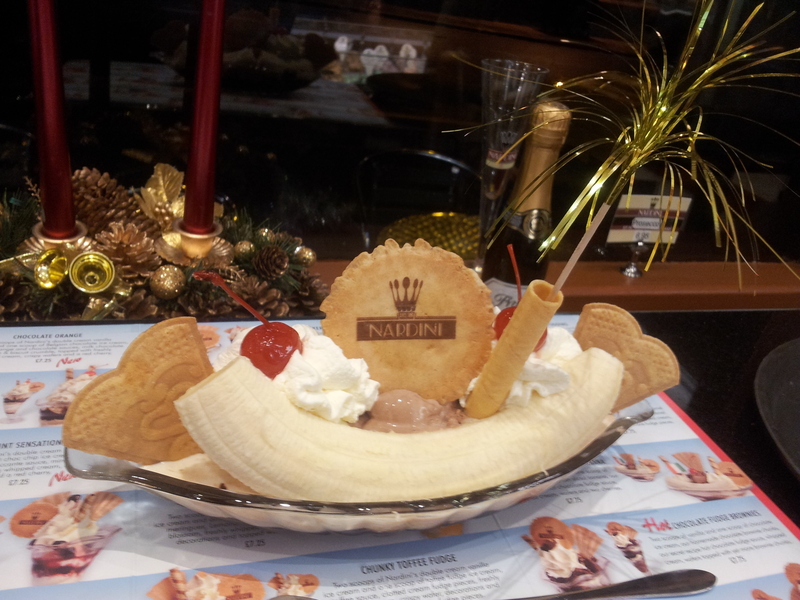 So, the final verdict…it’s not exactly a glass of a prosecco, and it’s probably more expensive than one (around £7 for my sundae), but I think, at least for the month of January, I could enjoy a good gossip with the girls over a banana split ALMOST as much as I could over a glass of fizz. Previous Preserving that festive feeling!